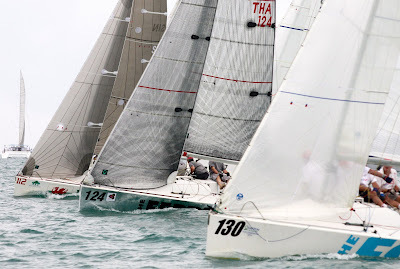 Over the past two days Sydney’s Easy Tiger Racing crew have been busy preparing their chartered Platu 25, The Ferret for competition in the Platu Coronation Cup at the Top Of The Gulf Regatta in Thailand which kicks off today. Skipper Chris Way and his four crew members have had their work cut out for them in order to have their boat race ready and no stone has been left unturned. “Thursday was a big day for all of us as we only arrived the previous night and naturally we had to familiarise ourselves with the local nightlife. But even the dusty ones got into it and contributed 110% the next day even if they'd much rather have stayed in bed. "It was the usual Tiger bottom preparation where we restored the hull to a completely smooth finish with a wet rub using very fine 800 grit sandpaper,” Way said. “We checked out every piece of equipment thoroughly, replaced any gear that required replacing, cleaned everything and scrubbed the boat until she squeaked. We then launched the boat and hoisted the sails to make sure they were the right fit as I ordered a new set from Scott Duncanson of Quantum Sails for this regatta,” he added. “After a day working in these extremely humid conditions we lost any excess weight so that by the time we all weighed in we were right on target, 400 kilograms." Later the crew went Go Karting to get an adrenalin rush. Tom Spithill proved to be the most proficient on the racetrack followed by tactician Peter Winter and Chris Way. This may become a daily activity. Dinner followed and then a quick stroll through Walking Street before calling it a night. Team Tiger have a strict evening curfew imposed upon them and are not allowed to be home before 2:00am. According to Kev Scott, Thailand Platu 25 National Class Association coordinator Way and Team Tiger are well positioned among this highly skilled fleet. “Chris Way's team have chartered my own boat, and the boat has won this regatta twice in four years. With Chris on board the team has a very good chance to be on the podium if not win it overall,” Scott said. Scott said there are some excellent crews racing this year and he is expecting a very competitive four days of racing. He believes there are six teams who are all capable of winning including Australia's Ian Short, Singapore's Shaun Toh, Rolf Heemskerk from Malaysia and a Japanese crew from Japan. “There will be 15 crews all on identical one design boats so it’s the crew that makes the difference. Teams are also coming from Cambodia, the Philippines and Singapore. One team in particular from Australia led by Fraser Johnston is made up of five guys who are all ex-champions even if they won’t disclose their ages.